If you’re up for a bit of adventure, then renting a kayak and heading off into Stockholm’s many waterways might be the thing for you. 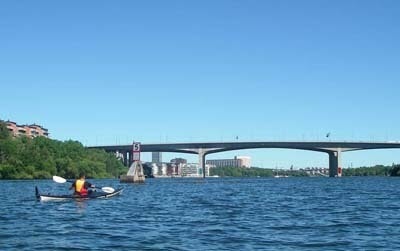 Kayaking has become a very popular part of urban life in the Swedish capital and seeing those little colourful plastic vessels bobbing around is an integral part of Stockholm’s water views. As the city is built on many small islands, a kayak is a perfect way to experience it. There are many places around Stockholm to rent, the most popular being in Rålamshovsparken on Kungsholmen, on Långholmen and in Pampas Marina in Solna. You don’t to have kayaked before to rent, although since you’re heading out into water, it’s a good idea to have lessons or a little previous experience under your belt. Life belts are provided. Popular routes are around the island of Kungsholmen, where, from the glistening water, you can take in the Old Town, the City Hall, the coastal stretch of Norrmälarstrand and the architecturally interesting dockland development of Lindholmen. Another route is around Långholmen, skimming through the narrow boating canal, skirting the island of Södermalm and propelling along the grandiose lake Mälaren to see the woodlands and bathing areas along the water’s edge. One of Stockholm’s brand names is ‘beauty on water’. From a kayak, it’s hard to disagree.